TENS OF THOUSANDS of Iranians spent a second night in the open air after a 7.3-magnitude quake struck near the border with Iraq, killing more than 400. People who had fled their homes when the quake rocked the mountainous region spanning Iran’s western province of Kermanshah and Iraqi Kurdistan on Sunday evening, braved chilly temperatures as authorities struggled to get aid into the quake zone. Iran has declared a national day of mourning as officials outlined the most pressing priorities and described the levels of destruction in some parts as “total”. “People’s immediate needs are firstly tents, water and food,” said the head of Iran’s elite Revolutionary Guards, Major General Mohammad Ali Jafari. AFP, like other foreign media organisations, has not been allowed to visit the scene of the disaster. By late yesterday, officials said all the roads in Kermanshah province had been re-opened, although the worst-affected town of Sar-e Pol-e Zahab remained without electricity, said state television. The tremor shook several western Iranian cities including Tabriz and was also felt in southeastern Turkey, an AFP correspondent said. In the town of Diyarbakir, residents were reported to have fled their homes. 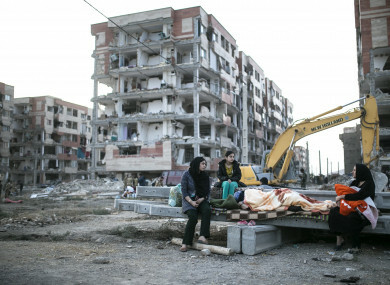 Email “Survivors of Iran quake that killed more than 400 spend second night in the open air”. Feedback on “Survivors of Iran quake that killed more than 400 spend second night in the open air”.